By now, many of us actually have CS5 up and running on our computers. Some have had easy installations. Some have not. Unfortunately, I am in both camps. I had an easy installation. And, I lived through the installation from hell. I trust that most of you will travel the “easy path”. The software is solid and, in most cases, it is installing and running perfectly. But, in some cases, idiosyncrasies on our hard drives create installation problems. So, for those of us who will or have had issues, I decided to create a post to share what I learned while solving those I encountered. 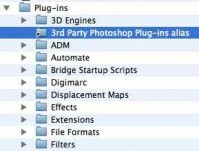 If your installation of CS5 went perfectly, like one of mine did, you may want to skip this post. However, if you’ve run into problems, take a look; if they are the same issues I ran into, this article may help. Nothing could have been easier. It took less than 2 hours to install my CS5 Master Collection (almost all of the software Adobe makes — save Lightroom); it was seamless and painless. It took another hour or so to follow the protocol I set forth in the original feature article. So, within 2.5 hours I had a bullet proof installation of CS5 on my laptop. And, to back it up, I had my original, fully functional, installation of CS4. I spent the better part of two days trying to get a rock solid installation of CS5 on my desktop computer. A good part of that time was spent on the phone waiting for and talking with an “outsourced” and somewhat underwhelming Adobe Support Center. 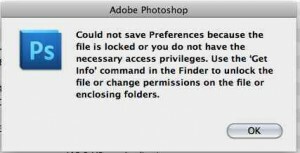 In fact, in the end, with the help of a handful of friends, including NAPP’s incredible Peter Bauer, and perhaps the nation’s best Mac consultant, Benjamin G. Levy of Los Angeles, I solved the problems in spite of the advice I was given by Adobe. During the struggle, I did extensive online research and determined that the issues I faced were not unique to my installation. Because others had similar experiences, I decided to update this post. So, I decided to run the installer, again. I opened it up and it indicated that all of the programs were installed on my Mac and that there was nothing left to install. But, it did allow me to run the installer again. I checked off all of the “missing programs” and ran it. Same result. They remained lost. Interestingly enough, when I did a “Spotlight” search on my hard drive, I found that the installer had created folders in HD>Library>Application Support>Adobe for some of the missing Suite programs. So, I had support folders but not the programs themselves. That’s when I made my first call to Adobe. The rep told me to download the Adobe Support Advisor program. 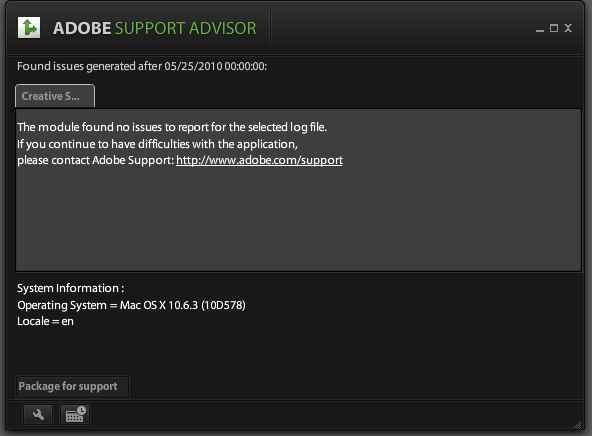 Support Advisor reads the Installation Log file created by the most recent installation of an Adobe product or Suite. It was supposed to determine what went wrong with my installation. But, it didn’t. It told me that there were no issues with the installation. Hmm. 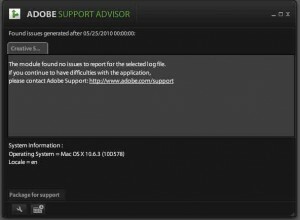 Even so, if you are having troubles with your installation, I suggest you start with the Adobe Support Advisor. If you are lucky, it will give you the feedback to solve your problems. But, I had to go further. 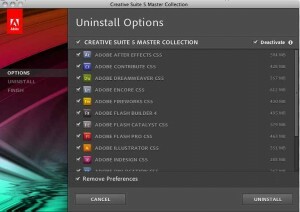 I decided to “uninstall” the Adobe CS5 applications. I wanted to do so in a way that did not disturb my CS4 installation; more than ever, I needed that application to be functional; it was my safety net. I suggested to the Adobe rep that I use the Adobe Uninstaller for the Suite. He adamantly told me not to do so because it would also uninstall CS4. 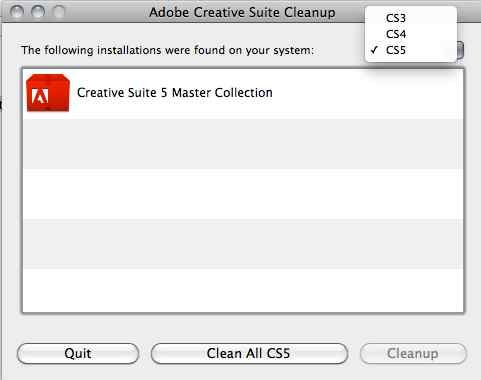 So, I dragged and dropped all of my CS5 stuff in the applications folder to the trash. I did a Spotlight search on CS5 and threw away all of that stuff, too. At that point, I decided that Adobe Support was not the answer and contacted Peter Bauer. I’ve written about Peter several times before. He’s the guy who runs the NAPP Help Desk. Having access to Peter is worth the entire cost of the NAPP membership. He’s that good. It was after 11 PM; having wasted an entire day, I was frustrated and cranky; I figured I’d send an email to Peter and await a response the following day. The response came back in less than half an hour. And, Peter lives in the Eastern Time Zone — so he was responding after midnight. I followed my hunch and his advice and resolved issue #1. CAVEAT: I do not run uninstallers unless I have my hard drive backed up; I had several redundant back ups of this drive and also a Time Machine backup. So, I knew that if things went wrong, I would not suffer irreparable loss. Here’s a picture of the Uninstaller. Note that it is set to erase the Preference files and to Deactivate the program. Deactivation clears the license with Adobe so that you can install and use the program again. 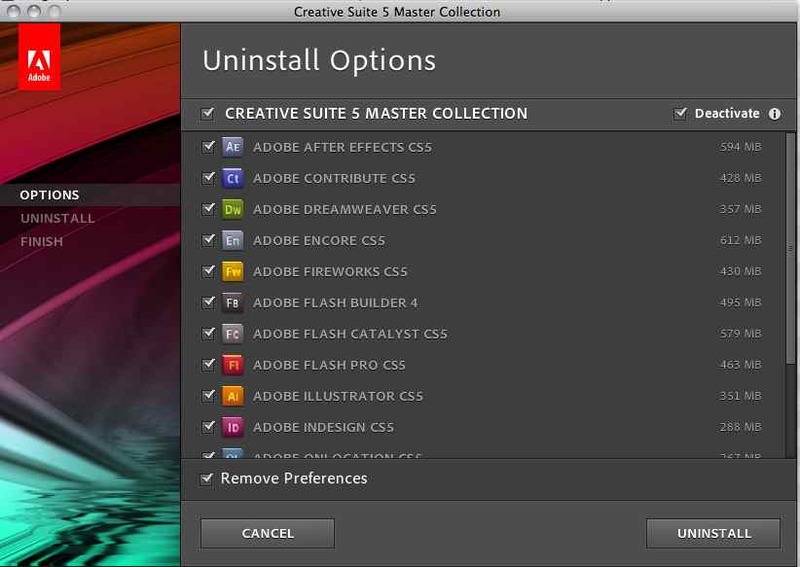 I ran the uninstaller and all of the Adobe applications from CS5 were gone. 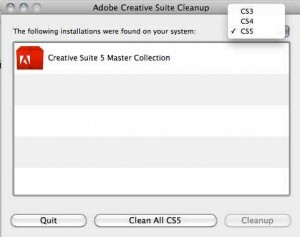 I hit “Clean All CS5” and, for the first time, was confident that CS5 was officially eradicated from my computer. Now, it was time to start over with a new, clean install. Interestingly, Peter suggested a protocol similar to the one that I use whenever I install new system software on my Macs. (I added two steps of my own). 1. My Steps: In Disk Utility, I repaired my Permissions. After that, I ran Disk Warrior to create a new directory. This was being super cautious, but I wanted to eliminate all possible problems. I was on my second day of this installation and did not look forward to a third. 2. Here’s where Peter and I agreed: I shut the computer down and disconnected all of my external hard drives. I restarted the computer in my Administrator account. I inserted the Master Collection CS5 DVD and ran a “default” installation. Voila! A couple of hours later, I was celebrating the complete installation of the Master collection. But, I was celebrating too soon. I won’t bore you with the steps I took to make sure I had the proper privileges to save the preferences. Suffice it to say, those steps did not work. I also “zapped my parameter RAM” on my Mac; still no help. I was totally frustrated, again, so I fell back on a procedure I often follow when fighting software battles — I shut down the computer and rebooted into another Administrative Account that I created, long ago, for just this situation. It is a “pure” or clean account; I call it “Test” and only use it for troubleshooting. I’ve done nothing to change it from the day it was opened. The theory is that if the software runs properly in this pure account, the problem is in my User account, not the software. Now that it was all loaded correctly, I had a base line installation to test. So I did. And, Voila2, it worked perfectly in this account. So, now I knew that I had a solid software installation. The problem was in my User’s account. Many Mac people would advise someone in my position to simply create a new User’s account. But, the consequences of doing that are significant; I had a lot invested in this account and identity and did not want to have to recreate years of links and uses including the way my computer related to my iPhone, MobileMe and my laptop..
Ben told me that those steps would be the equivalent of creating a new “User” account as far as the Adobe products were concerned. What about the stuff I had thrown away? Like a lizard growing a new tail, the Adobe programs would create new, untainted files to replace them on the next start up. And, when I started up, everything worked perfectly — and it still does. OK, why was the installation on my laptop so successful and the installation on my desktop such a battle? As an NAPP member, I downloaded and Beta-tested CS5. I was extremely cautious when I did so. I used an external hard drive with its own operating system. When I wanted to test, I booted from and worked on that drive. Why? The word prophylactic comes to mind. I didn’t want any problems with my test software to move to my main hard drive. But, Duh!! !, in moments of passion I forgot to use my safeguards. Instead of booting from the external disk, I booted from my computer and reached out to the external disk to run CS5. Somehow, I think this infected my user account. To make matters worse, when CS5 hit the market, I placed my order. But, the software was not shipping. So I downloaded a trial version to another external drive and used that version until my DVD’s arrived. Again, too much passion and too little caution. I think the free trial also messed things up on my main drive. Why did the laptop not suffer these discomforts? Because I never ran either version of CS5 on it. Lesson Learned: From now on, if I ever run Adobe Beta software or use a trial version, I will run the Uninstaller and Script Cleaner BEFORE attempting to load my purchased version. And, I will go through my Mac folder to clean out the stuff mentioned above, too. Unlike the Adobe rep on the help line, I have total confidence in the Adobe Uninstallers and Script Cleaners. They are edition specific. They did not alter my CS4 because I did not ask them to. They did exactly what they were supposed to do in the way they were supposed to do it. I will not hesitate to use them again. Will I load test or free trial software again? I don’t know. As I sit here, today, having gone through this mess, I’d say not. But, who knows where my passion will drive me when the next versions come out. My guess is that, after the memory of the struggle fades, I’ll jump in to testing whatever new stuff comes out. But, I’ll make sure to practice safe testing. And, I’ll use the Adobe software to clean up before loading the final versions. Of course, we all have to learn our own lessons. I post these not as a foolproof guide but only as a suggestion as to how to approach problems. Because installation issues are so idiosyncratic, I can’t tell you to do what I did or tell you that it will work. If you choose to try my steps, PLEASE minimize the inherent risks by backing up your drives BEFORE you try any of them (or any steps you read about or are recommended to follow — even by the Adobe rep’s). My guess is that, because CS5 is so solid and installs easily on most computers, very few of you read this article. However, for those who did, I hope it helps. If you have any questions, don’t hesitate to contact me using the contact function on the home page. I had zero problems on a Vista 64 machine. I read your article as entertainment – a bit perverse probably. Concern over such problems was a major reason I didn’t take up the NAPP offer for beta CS5. Sounds like it worked out good in the end. I really like CS5 – just waiting for the NIK 64 bit upgrades. I think it less a platform issue than one of somehow corrupting files with either the Beta or trial versions. I have no idea whether there are similar issues with Windows machines because I didn’t look at the Windows support forums. Actually, once I was on the right path, it was traveled quickly. That’s why I wrote the follow up. I spent more time trying to find out what to do than doing it. I really like CS5 and, in the months to come, will write about the features I find most helpful.